It’s reassuring to remember that avant-garde photography did not begin with that time that we applied the ‘Toaster" filter to our Instagram from the beach at Saint-Tropez (damn we looked trendy tho). Alvin Langdon Coburn began doing incredible things with film at the end of the 19th century. The photograph above comes from 1914. 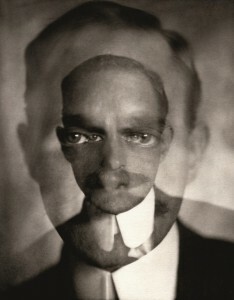 A Coburn retrospective is on in Madrid at the FUNDACIÓN MAPFRE until the 8th of February. Flaunt hasn’t played with its dolls since He-Man’s irreconcilable differences with Malibu Barbie came to the fore in the bitter Spring of ’95, but this très-fabulous feature for 12 of the world’s greatest fashion houses by photographer Giampaolo Sgura in Vogue Paris has us yearning to brush the dust off our Disco Ken. As the human population bloats towards a monstrous 8 billion by 2030 (but don’t worry we still think you’re special), radical changes to the nature of our urban environments are inevitable. MoMA New York have brought together six interdisciplinary teams to examine the architectural prospects for six different metropolises. Their insights are shared in the exhibition; Uneven Growth: Tactical Urbanisms for Expanding Megacities. It runs until May and features envisioned projects like this proposal to add new artificial islands to Hong Kong. We at Flaunt are huge fans of ambitious (and moderately ludicrous) DIY projects. 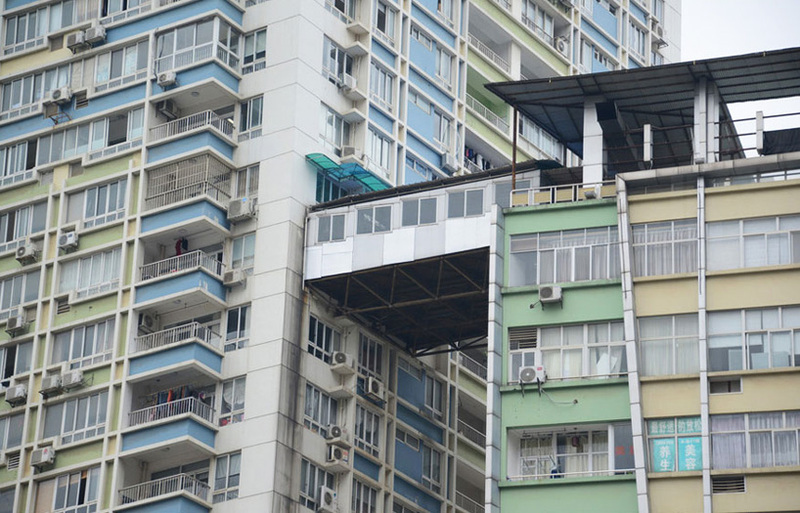 So we feel obliged to tip our hat to the handyman-or-woman go-getter behind this enterprising corridor that has been jury-rigged to run between two high-rise apartment towers in Nanning, China. It is rumored to have transformed its owner’s apartment from a single into a double. Just fabulous. If you’re tempted to pursue a similarly audacious piece of urban planning we feel obligated to suggest that you first consult with an engineer, and that secondly you put your attorney on speed-dial. Frank Gehry’s ethereally armored Louis Vuitton Foundation in Paris was perhaps our favorite piece of architecture of 2014, and it is already hosting art worthy of its form. The visionary Icelandic-Danish installation artist Ólafur Elíasson has assembled the stunning exhibition; Contact. It’s on until mid-February and has already met with major critical acclaim. If you’re in touch with your inner truculent geriatric and are looking for another career to add to your ‘damn robots stole our jobs’ list, then bid adieu to the obsequious valet. 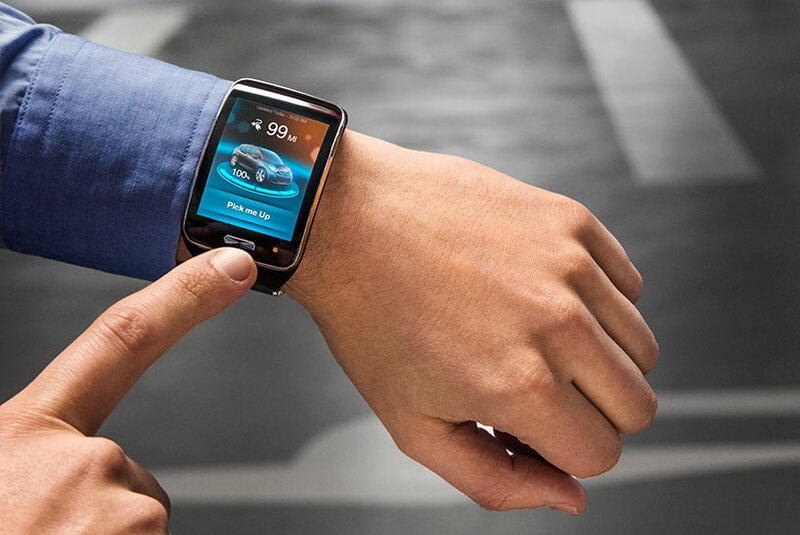 The evil (at least to men in red velvet pants) geniuses at BMW have announced a fully automated parking system, operable via smart-watch. Drive your car in to the car park, get straight to your appointment with your cobbler, and let your beamer park itself. 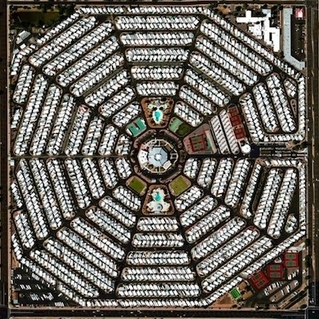 From hi-fi to lo-fi, the next time you stumble upon something inexplicable on Google maps (is that curious W shape a truant letter from the nearby Walmart, or could it be the entrance to the crypt containing Captain Kidd’s lost treasure?¿?! ), why not send Diane to investigate? Diane Goes For You is the project of a human search engine known only as Diane. She has already embarked on Google Maps inspired adventures to Finland, Britain, Sicily, the Netherlands, Romania and the Ukraine to name but a few. It’s commonly said that the best way to enjoy your scotch is neat or with a finger of water, personally though we prefer it on the rocks. For all those who like their whisky chilled and their vodka frosty, Icehotel in Sweden has just opened its 25th annual Icebar, named; BOOOM! It’s open until it melts. From the dissolving to the intangible, VisualSKIN have created something special with their luminescent ghost ship that’s currently ghost-docked in a canal for the Amsterdam Light Festival. 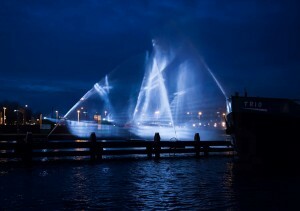 The illusion is created by jets of water, light projectors and the souls of drowned sailors. It runs until the 18th of January. For all of the fashionistas out there who have been dying for years to tweak out Santa Claus’ tired red and white garb, your salvation has arrived. 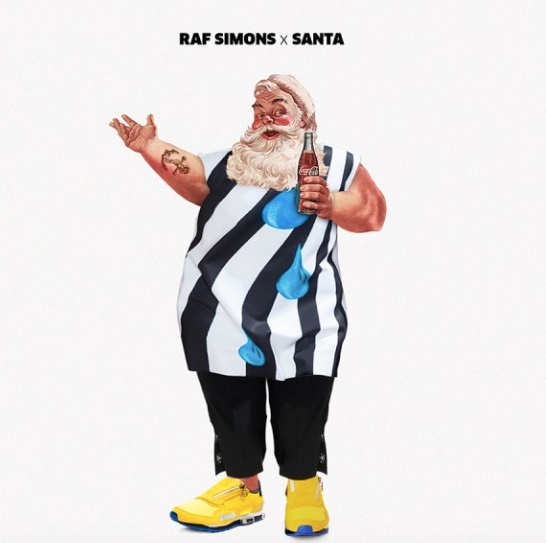 Creative agency Joint London have released a series of downloadable Christmas Cards that feature the jolly-fat-man flaunting luxury brands like Raf Simons, Saint Laurent and Alexander Wang. As a potent cure for lost groove (personally, Flaunt’s groove has never strayed further than our back-pocket) D’Angelo returned this week after a prolonged album silence of 14 years. Black Messiah mixes the artist’s delicate vocals with everything from sultry Spanish guitar to Hammond organ funk. We eagerly await the Yeezy response to this claim of a second (third?) 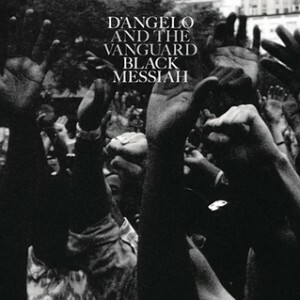 Black Messiah. We like performances, particularly when they’re mixed with cocktails. This Saturday Happy Hour Agency are serving cocktails inside a painting at a pop-up event nestled in the forests of Highland Park in Los Angeles. The collaborative event is called The Cozy Castle and the first seating is at 6pm. Each year the Boston Globe’s Big Picture assembles its Year in Pictures. The collection is inevitably startling, beautiful, painful, inspiring and upsetting in equal measure. It’s worth having a look, though it’s not all comfortable viewing.